Once upon a time there was a sport that was in a panic. It was offering something hideous to the paying punter. Something that sent it all into the realms of farce. Something that bore no resemblance to what the sport 'was about'. You might have worked out by now that I'm talking about F1 earlier this year, wherein it seemed that many were insistent that the sport was writhing foetal on the therapist's chair, all to do with the pariah of the Pirelli tyres. Language of woe, woe and thrice woe was much in evidence. To quote one (not untypical) example, one member of the press after a particular race wrote that what was on show was 'tyranny of the tyre...the unloved novelty of four stops per car is conspiring to reduce the sport to a rambling sequence of place-swapping that bears little resemblance to racing'. 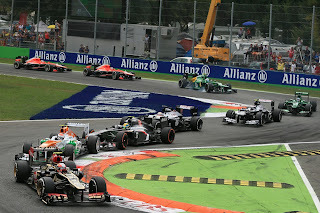 Plenty of fans, along with certain team principals and drivers, bemoaned that the rubber didn't allow drivers to push all the time and on occasion even required deliberate ceding of positions in the name of tyre-saving, and that it all was forcibly ripping F1 away from its most sacred principles. The only race on show was that to the bottom. But a handful of months is a long time in F1, clearly. A few races, tyre failures and subsequent revisions to the Pirellis' design later, and by last Sunday's Monza race we had something very different. 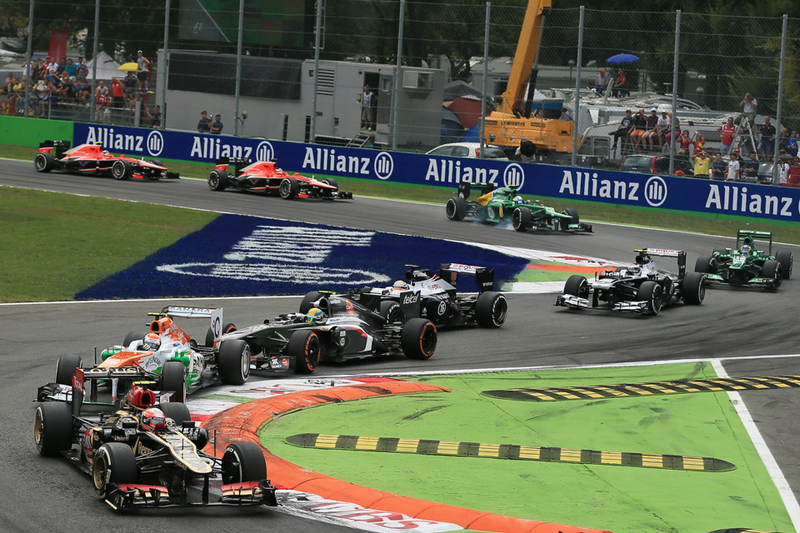 Martin Brundle noted that it was a lot like 'a Bridgestone race', with one-stop strategies pretty much all round and almost no rubber degradation, which allowed everyone to drive at near the limit throughout. So, were we all happy? No, not entirely. Apparently the fare had become too tepid. But really this outcome shouldn't have been a surprise. To start with a little reminder of how we got to where we did, for years prior to 2011 the sport had wrestled with the fact that racing cars weren't actually racing each other very often. Of course, much of it was an unintended consequence of aerodynamics and resultant 'dirty air', meaning cars often couldn't run very close to each other through the corners. But part of it too was the lack of variation in pace during a race resultant from tyres that allowed drivers to push all day (and exacerbated for a time by refuelling turning races into a series of sprints), and it's variation of pace that creates overtaking as well as less predictable fare. In the 2010 Canadian Grand Prix the sport stumbled upon a solution however as Bridgestone, the tyre supplier of the time, got its sums wrong and rather than providing its usual tyres that would easily last a race turned up with those of the gumball variety, way too soft to last even half of the race. And the race we ended up with was a thriller. For an afternoon - and after years of famine - we had F1 racing again. Bridgestone nevertheless refused to provide tyres again like those it had inadvertently in Canada but when the Japanese firm left the sport at that year's end its replacement Pirelli was asked to produce something similar, deliberately, every time. And broadly this is what the Italian company has done ever since. This is why those who snipe at Pirelli, and lobby for a return to the supposed 'good old days' of Bridgestone-spec F1, have never got any support from me. And over and above this, a major reason why I didn't support those pushing to have the tyres revised earlier this year (before the Silverstone failures forced everyone's hand) was that the evidence of every season since Pirelli returned to the sport in 2011 is that the tyre influence gets less potent as the year goes on by itself anyway, as teams gradually get their heads around the challenges. The races therefore get more processional as the season progresses, and what do you know complaints start to swirl that races aren't as entertaining as before. It happened in 2011, and in 2012. And it astonishes me that recollection of this rather consistent pattern apparently escapes so many so quickly. 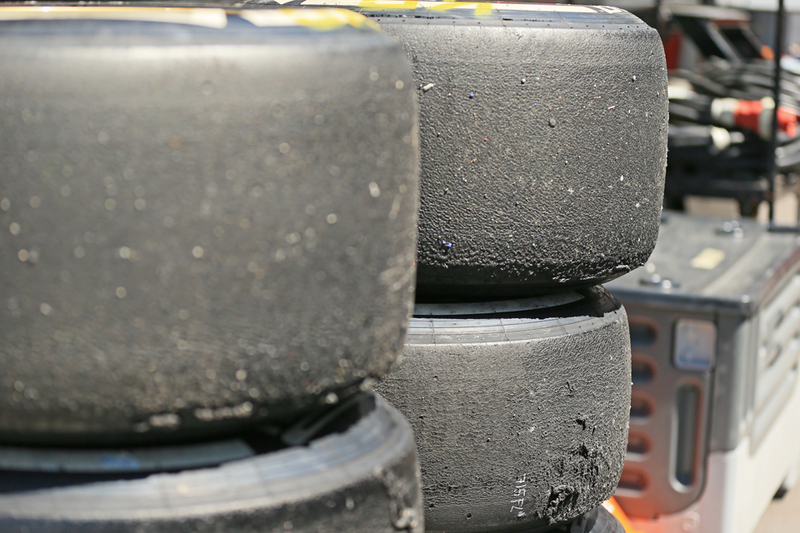 I felt that changing the tyres to reduce degradation would only accelerate a process that would happen anyway, as well as send the tyres too far in the opposite direction and thus pour cold water on the heat of the racing. And so it's happened. And perhaps there has been a resultant double-whammy by - probably not by coincidence given the hammering it had been getting - Pirelli's compound selections in recent races being conspicuously cautious too. Given all of this Pirelli would be forgiven for feeling that in order to fend off the criticism it gets all it has to do is walk a very delicate tightrope. While performing an intricate juggling act. And all the while not always getting much help from the circus troupe, as well as having to cope with being jeered by many audience members in the big top. As Brundle further noted: 'So all we ask for is that the tyres spice up the racing without dominating it, using only two of four available compounds of dry rubber at 20 different circuit layouts and surfaces in wildy varying climates on 11 different chassis and 22 driving styles...'. With all this in mind perhaps the most astonishing thing is that Pirelli has got it just about right as often as it has. You wonder also if the happy medium wherein the balance will please just about everyone even exists. Actually, thinking about it, it probably does not. I reckon that, as Kimi Raikkonen noted amid the rumpus I outlined at the outset, 'people will always complain'.